Power to Change Your Place in Life gives you all the spiritual and intellectual tools you need to overcome the challenges in your life. Pastor Dr. Yehuwdah E. Chad-Umoren paints a multidimensional, easy-to-understand and implement word picture of how to move your life from where you are into your God-given destiny. This is possible no matter where you may be at the moment. Power to Change Your Place in Life is a strong and proven-effective tool to successfully transform your position in life. Grab hold of that power today! Life is a challenge. Life is like a field full of thistles and thorns that one must negotiate on bare feet without being pricked to death. Life is like a battlefield full of dangerous landmines planted by enemies who seek to destroy your visions and dreams. Ironically, however, the challenges of life also present to us opportunities for glory! 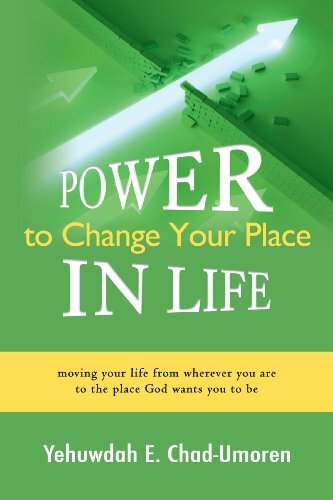 In Power to Change Your Place in Life, Dr. Yehuwdah E. Chad-Umoren gives us the spiritual and intellectual tools for overcoming the challenges of life. He paints a multidimensional word picture of how to move our lives from where we may currently find ourselves to where God intends us to be! Through this book, the author shows that this is possible no matter where you may be at the moment. Contained within these pages are divine directions from the Holy Spirit. They give us deep insight on how to see the future while still in the present and how to create and re-create desirable reality out of unfavorable circumstances! This book shows us the foundation for greatness, the pattern for building right foundations, the faith that leads us to victory, how the power of desire and dreams can be harnessed through strategic thinking to get you out of shame—and how to let your tongue loose to move mountains, walk on water, get connected, and stand your ground in moments of great harassment. Dr. Yehuwdah’s book is a powerful instrument of change for those who seek the power to transform their position in life. It is a creative mix of a motivational material with deep intellectual content. It is well-written, racy in nature, and captivating to the intelligent reader. It is also full of wisdom principles that propel us to believe that anybody can come back after a setback and that our problems may have lasted but our problems are not everlasting. I wholeheartedly recommend this book to all who seek to change their positions in life!